Today we are taking a look at the Kickstarted Ditto by Simple Matters. 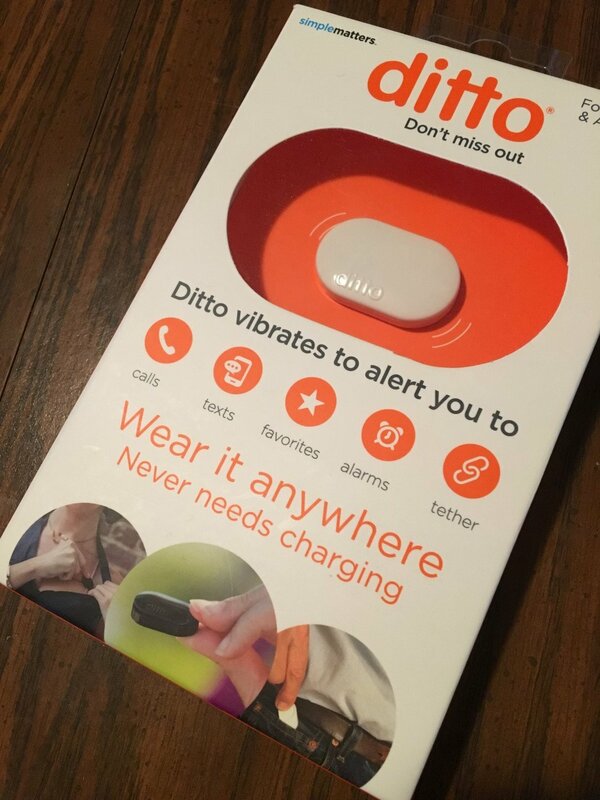 The tagline for the product is “Never miss what’s important.” The Ditto is a small wearable device that you can customize to deliver notifications. During my time on this review, I have found this is all about setting expectations. Ditto has a virtual tether that reminds you whenever you’ve forgotten your phone. Ditto never needs charging! There’s no buttons, no cables, no inconveniences! Ditto is customized through a user friendly mobile application. Included in the box is the Ditto unit, velcro band, and battery unit. There is a small instruction booklet that shows you how to assemble the unit and the application to needed to install on the phone. The Ditto supports both iOS and Android. It doesn’t appear that all phones are supported, so check the support site first. The setup process is very simple; the application guides you through the setup and pairing process and it is very quick. It is here that you get to see the first time the Ditto vibrates. I would describe the motor as surprisingly powerful, particularly because of how quiet it is. Launching the application, you can customize the types of notifications and the events that trigger them. There are also a growing number third party apps that are supported by the Ditto, including Google Hangouts, Facebook, and WhatsApp. You customize the alerts by picking the number and durations of vibrations for each alert. I found it easy to differentiate between a few but really most notifications indicate you’ll need to check your phone. In other words, the interaction on the Ditto is all one way. That is, basically, because the Ditto is only for notifications and does not offer any actions. Users can also enable an option called tether which will alert when your phone gets too far away from the Ditto. If you wish to fine tune your alerts, you can. For example, it’s possible to specify which specific text messages or calls will alert users. Rounding out the feature list is the standard alarm or timer notifications. Updating the firmware and performing maintenance is also handled in the software. I was able to update my review unit’s firmware easily and quickly with no wires. Speaking of firmware, you can also check the unit’s battery level. After about a weeks’ worth of use, the battery was still at 93 percent. Replacing the battery is a simple affair. I should also mention that the warranty period is one year. That seems fair if not a little generous given the price point. 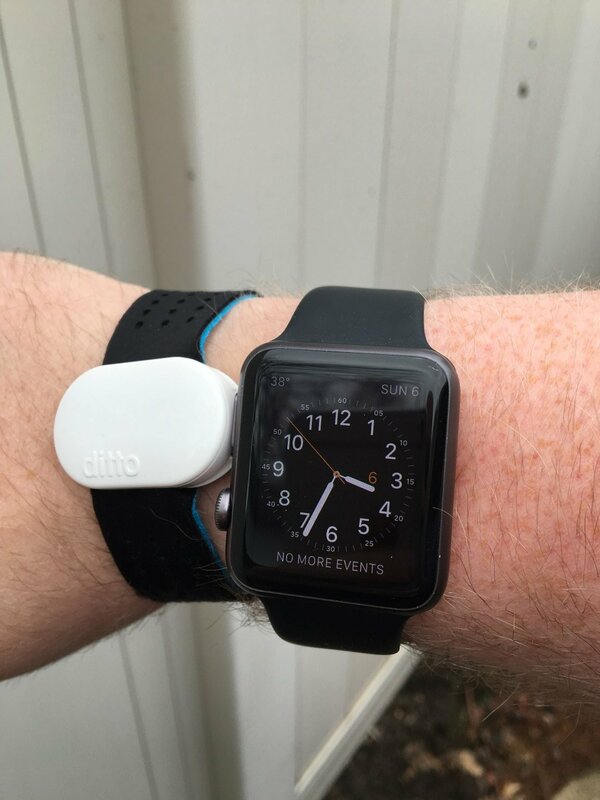 Wearing the Ditto is easy and more flexible than most smart devices I have used. You can either slip the Ditto through the included velcro band, clip it to your clothing, or even keep it in your pocket. If you do wear it on the wrist, you can have the Ditto on the inside of your wrist as opposed to the top since you don’t need to access it. 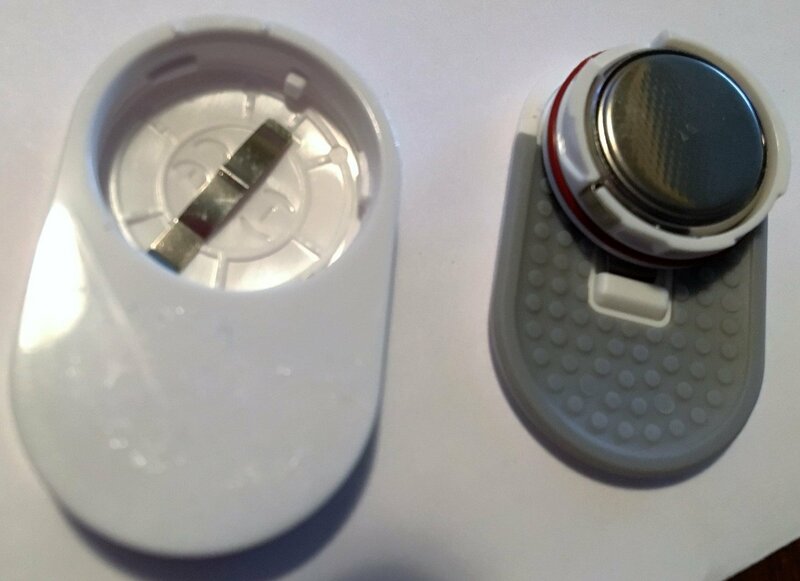 The inside of the Ditto’s clip is grippy and the unit itself it lightweight so the chances of dropping it are slim. Speaking to the unit’s build quality, I found it small, lightweight, but a little on the thick side. This was, naturally, to accommodate the battery and motor. The Ditto is advertised as IPX7 certified so you can shower, swim, and wash your hands without removing it. So how well does this all work? It works very well for what this device is trying to accomplish. This will not replace an Android watch or an Apple watch, but at a list price of $39 it was never meant to. Ditto is also very simple and low maintenance and should appeal to a much wider range of people. Some might say that the weakness of the Ditto is that you don’t use it to interact with your phone, or that it is a one way device. With a full smart watch, I can review the notifications and not pick up my phone. But let’s be honest here, I have used Android and Apple watches and they still aren’t as easy and natural to use as the cell phone they are paired up with. That and the fact you have to deal with recharging and sometimes performance issues given their complexity. The Ditto is not a smartwatch alternative, it’s a simple extension of the phone you already have. For that purpose and scope, it is a great product.